A leaking pool is no way to have fun in the sun! Leaks will end up costing you a lot of money and wasting many gallons of water. It’s best to identify them and get them fixed as quickly as possible. If you suspect that your pool may be leaking, performing an easy-to-do bucket test is the best way to find out for sure before you call in the professionals. To do a bucket test, you will need a 5-gallon bucket and a grease pencil or permanent marker. A small tape measure can also be helpful. You can find 5-gallon buckets at any hardware or home supply company, such as Home Depot or Lowe’s. They’ll also have grease pencils and markers if you don’t have one handy. Get started by filling your pool to its normal level and shut off the pump so the water in the pool settles down and you can make accurate marks. Next, make a mark on the inside of the bucket about three or four inches from the top and fill it to this level with water. You may need to weight the bucket with a brick or rock, but if you do, make sure you adjust your markings accordingly to account for water displacement! Place the bucket on the first or second step of the pool. After you have the bucket ready and in place, mark a line on the outside where the water in the pool currently reaches. Turn your pump back on and make sure that the auto or manual refill valve is shut off for the next 24 hours. The large surface area at the top of the bucket allows the water inside to evaporate at the same rate as the water in the rest of your pool, which will ensure the inside of the bucket is experiencing the same conditions as the pool. After 24 hours have passed, check the lines on the bucket and measure the water levels. If the water in the pool has gone down more than the water inside the bucket, you have a leak! 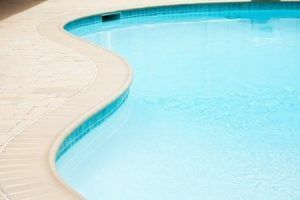 After establishing that your pool is leaking, it can be difficult to find out where the leak is, and figure out what the best course of action is to fix it by yourself. Alpha and Omega Pool Services in the Henderson, NV area has many years of experience dealing with leaking pools and will get your pool back up to par in no time, letting you return to enjoying your summer and your pool worry-free. Contact us today to set up an appointment to fix your leaking pool and we’ll be happy to provide you with top professional care.